Despite little or no engagement, 82% of small businesses believe digital marketing is critical to success, a new survey finds. The majority of small businesses in the US do not engage in digital marketing, according to a new survey conducted by Clutch, a leading B2B research firm. The results suggest that potentially thousands of small businesses are negatively impacting their success, limiting their growth, and making it easier for competitors to capture and convert potential customers. Two reasons shape small businesses’ decisions to hold back on digital marketing: (1) the associated expense and (2) inexperience with the required tools and strategies. In reality, digital marketing is more accessible than ever before for small business owners and managers. Services offer easy-to-use software and tools for creating and managing email newsletters, building websites and mobile apps, scheduling social media posts, and tracking relevant metrics. 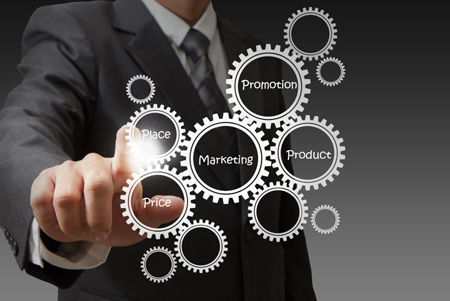 The tendency for small businesses to sideline digital marketing appears to be changing, the survey found. 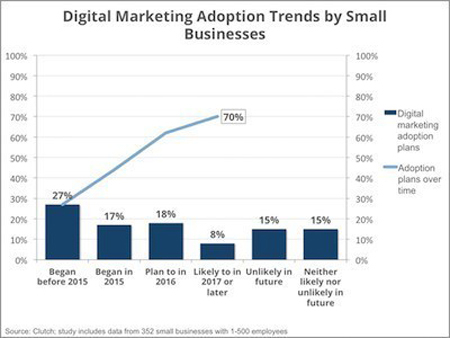 Over 80% of small businesses acknowledge that digital marketing is imperative to business success, and 70% indicate they plan to implement a digital marketing plan by 2017 or later. For the small businesses that do take the leap into digital marketing, social media is the preferred jumping off point. Nearly 60% of small businesses currently engage in social media, and nearly 75% say they plan to implement some type of social media marketing strategy by 2017 or later. Of the small businesses that currently have a social media presence, Facebook (89%), Twitter (49%), and LinkedIn (42%) are the most popular platforms. Clutch’s small business digital marketing survey included 352 owners and managers of small businesses in the US. The majority of survey respondents are businesses with 1-10 employees and less than $1 million in annual revenue, which matches the makeup of the 2013 US Census Bureau data on small businesses. The survey also measured how often small businesses post content and engage with followers on social media, and the metrics they use to track their effectiveness.